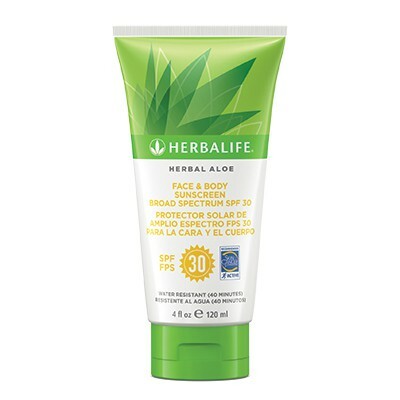 Herbal Aloe Face & Body Sunscreen is a broad spectrum UVA/UVB SPF 30 sunscreen for the entire family that is also water and sweat resistant for up to 40 minutes. Protect your skin with this broad spectrum sunscreen that is water and sweat resistant for up to 40 minutes. Contains aloe vera to hydrate the skin, leaving it soft and smooth. *Tested on subjects, measuring skin moisture levels at eight-hour intervals. Skin of 86% of subjects showed double the moisture levels over baseline after eight hours.